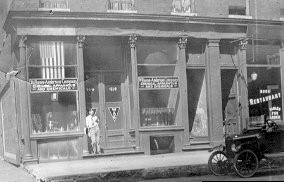 Henry B. Wilkens first opened our doors for business May 16, 1918. The ensuing years saw us move to a new address and experience substantial growth. While a tremendous amount of change has occurred during those first 88 years, the one thing that has not changed for us at WACO is our vision and commitment to provide the best possible service to our customers. We look forward to the future resolved to continue to serve our customers as we have in the past with personal attention, flexibility and accommodation that the "one size fits all" giants can not equal. We pledge to provide quality service and quality products. You can expect understanding response from a staff of knowledgeable people, with average experience in the industry exceeding 11 years. You can depend on your order being handled with modern and efficient systems, and an appreciative attitude of accommodation that says, "sure we can do it. No problem," instead of "our system's not set up to do that." As always we can provide one source service for anything your laboratory might need, cross referencing competitors' and manufacturers' catalog numbers, finding nearly anything, shipping orders of any size, anywhere in the world. Wilkens-Anderson is still "The Source" for your laboratory. WACO's warehouse has the space to maintain a comprehensive inventory so your goods can usually be shipped the same day the purchase order is received. If you are seeking a special non-catalog item, we will expedite its delivery so your wait is kept to an absolute minimum. Try our personalized service and see what WACO can do for you.